People often nod sagely, and say of the bassoon “Wonderful instrument. No solo repertoire at all though; pity.” Well, if needed, here is concrete proof not only that such repertoire does exist, but that the bassoon is only rivalled by the flute amongst wind instruments in terms of the historic breadth of its music, from mid-Baroque through to the present day. Robert Thompson’s ambitious 4 CD set does indeed range from Vivaldi concertos of the 1720s to John Downey’s quintet of 2002. Thompson is a competent player rather than a virtuoso; his performances are often quite bland, and if you want the Vivaldi concertos, many of which, despite their formulaic profiles, are delightfully entertaining pieces — though never listen to more than two on the trot — look no further than the wonderful Naxos recordings by Béla Drahos. Valery Popov, the outstanding Russian fagottist, has also recorded a selection of them (MEL CD 1002098). CD2 is more rewarding; Franz Danzi was a talented composer, roughly a contemporary of Beethoven though far more firmly rooted in the Classical era. His three quartets are genuinely attractive, full of excellent themes, clever and sometimes quirky ideas, and extremely idiomatic writing for both bassoon and strings. In the end, one does come away realising even more strongly what exactly it was that made Ludwig van B so extraordinarily special; but that does not render these rather lovely works worthless. As with Vivaldi, go easy – one at a time. By far the most interesting music is to be found on CDs 3 and 4. Gordon Jacob was a composer whose rather utilitarian approach used to be looked upon condescendingly. But he was a workmanlike and skilful artist, and this very enjoyable concerto is a good indication of his virtues. 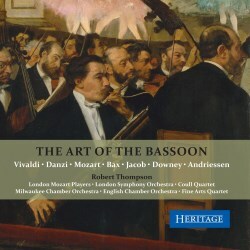 It also brings out the best from Thompson; his technique in the very taxing solo part is secure, and he is particularly expressive in the high bassoon writing in the middle movement. As far as I can tell, this may be the only extant recording of this fine piece. Next comes the American John Downey’s rather gripping work The Edge of Space. It’s an ambitious and wide-ranging piece for solo bassoon and a very large orchestra. At nigh on twenty minutes, it does go on a bit, partly because its formal design is so unclear. However, it does have some outstandingly effective moments, notably the big unison statement by the strings at around 7:00, and the beautiful chord that follows shortly, produced by exciting the rims of eight crystal glasses. The bassoon part, rather than a conventional solo, feels more like a commentary on the alien territory being explored by the orchestra. Downey is eclectic, and side by side with quasi aleatoric passages reminiscent of Penderecki, we have a rather wonderful jazzy interlude featuring the bassoon accompanied by vibraphone and plucked bass. This third disc is completed by Juriaan Andriessen’s Concertino from 1962, another absorbing and rewarding piece. This composer was the brother of the better-known Louis Andriessen, and wrote more film music than anything else. He also composed a fair number of concert works, and this Concertino is an interesting example. The bassoon is not a loud instrument, and it shares with all lower pitched instrument – cello, double bass, tuba – that it can very easily be drowned by higher, brighter tones. So Andriessen gives us just a wind octet as an accompaniment; furthermore, he begins with just the soloist plus the two bassoons from the ensemble, a dark, soupy sound. From there, things gradually brighten and lighten, with quicker scherzo-like passages alternating with more lyrical moments. Disc 4 begins with the Threnody and Scherzo by Arnold Bax, a true rarity, which the composer wrote for the great bassoonist Archie Camden in 1936. This is not an especially memorable or endearing work, but its unusual combination of instruments, together with the special flavour of Bax’s music, make it well worth a hearing. The bassoon very much shares the limelight with the harp, and some of the most striking moments are when the two instruments combine, with an inevitably Celtic impact. John Downey’s Quintet that follows is not as compelling a work as The Edge of Space. It does have some fascinating textures, particularly in the central slow movement where the bassoon is sometimes doubling the viola two octaves higher but the piece sprawls in an undisciplined way, making it a pretty tough listening experience. Warning! Do not under any circumstances listen to the embarrassingly awful version of the Mozart Concerto which completes this disc. How someone like Robert Thompson could possibly allow a travesty such as this to be published is beyond me; the recording sounds as if it has been made down a telephone, and the solo part is full of smudges, fumbles and fluffs. There’s hardly a trill that is executed successfully, and one place in the finale, Thompson chokes on his C#s. Unless you’re a bassoonist in dire need of cheering up, promise me, don’t listen. Thompson deserves massive credit for getting these discs - which go back a long way - up and running. Trouble is, he is not a particularly fine player. His tone is not well focussed, and his playing simply doesn’t have the soloistic presence of such outstanding modern masters and mistresses such as Milan Turković or Kim Walker. If you want to hear supreme musicianship and a demonstration of what the bassoon is really capable of, these are the people to listen to, as well as the players I mentioned in connection with the Vivaldi concertos. Worthy but in the end largely disappointing.